It's time for a new challenge at Time Out. Our challenge this week is a CASE challenge. We have this fun and wonderful card by Julia of Just One More Card. I was inspired by Julia's airplane and the diagonal striped frame. I thought her card was so whimsical and fun, and tried to capture that spirit in my CASE of her card. Please head over to Time Out to see more inspiration from our Design Team and Guest Designer. Our Guest Designer this week is Jenny. So sweet Joyce. Love that stamped airplane. Joyce this is just the sweetest, your airplane looks fabulous stamped in Ocean Tides and the red striped border!! You captured the movement perfectly! You should enter this for this week's Simon Says Stamp Wednesday Challenge make a border! Adorable card & wonderful case, Joyce! Such a sweet card! Love that airplane and those wonderful red stripes! I was so shocked to see that our cards were so similar! I love your design! Such a cute card! Loving your take on the challenge, Joyce! I love how you created movement with the airplane and banner, and your red and white diagonal stripes are fabulous! 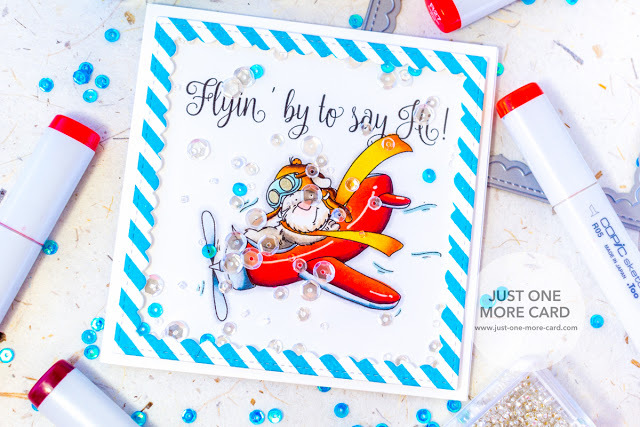 You definitely captured the whimsical and fun aspect of Julia's card - that airplane is fabulous! Great CASE! WOW! What a spectacular case of Julia's card! Your little airplane, wiht its birthday wishes banner, is charming! Sweetness to the 9th degree! I totally thought about doing an airplane - you did a great job and really captured the whimsy , fun and movement of the card. Thank you so much for having me over at TimeOut, I loved it!